A clear water-based gel is applied to the area of the body being studied to help the transducer make secure contact with the body and eliminate air pockets between the transducer and the skin. We then press the transducer firmly against the skin and sweeps it over the area of interest. When the examination is complete, the patient may be asked to dress and wait while the ultrasound images are reviewed. 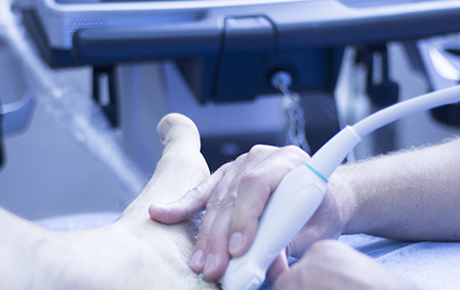 However, our doctors are often able to review the ultrasound images in real-time as they are acquired and the patient can be released immediately. After you are positioned on the examination table, we will apply some warm water-based gel on your skin and then place the transducer firmly against your body, moving it back and forth over the area of interest until the desired images are captured. There is usually no discomfort from pressure as the transducer is pressed against the area being examined. Our doctors may ask you to move the extremity being examined or may move it for you to evaluate not only anatomy but also function of a joint, muscle, ligament or tendon. Our doctors specifically trained to supervise and interpret radiology examinations, will analyze the images and send a signed report to your primary care physician or the physician who referred you for the exam, who will share the results with you. In most cases our doctors can discuss results with you at the conclusion of your examination.